The maritime market was one of the pioneers of satellite communications. With the need for passenger connectivity on-board ferries and cruise ships, to vital tracking and navigation needed at the helm of almost all ships, VSAT technology has provided a secure and reliable link for many years. There is one sector within the maritime industry that is now starting to truly embrace VSAT, however. The fishing sector might have battled with financial constraints and fishing quotas in the past, but increasing amounts of new investments in bigger, more advanced and efficient vessels is now beginning to drive the industry. Euroconsult established the maritime satellite communications market grew by 18.8% in 2017 with revenue looking very healthy, increasing from $935 million in 2017 to $1.6 billion by 2027, a 10-year CAGR of 5.2%. MSS (Mobile Satellite Services) broadband offering for fishing vessels has been a core component of connectivity for the fishing market. With tight operating budgets, and relatively small overall bandwidth requirements, the MSS business model was suitable for the vast majority of fishermen’s needs, until now. With the increased requirement for catch reporting, crew welfare and new safety regulations, more and more fishing vessels have been adopting VSAT. With prices falling too, owners can better manage not only their real-time fish processing and sales but crew communications and welfare. Smaller vessels across Europe have also increasingly been adopting VSAT as a result of compact antenna sizes, even lower Ka-band service costs and the ability to offer quality, high-performance broadband, even in the harshest weather conditions. With 6.4 million tonnes of fish being caught each year, from Iceland to the Barents Sea, the European fishing sector is the world’s fourth largest. In terms of maritime VSAT installations, Europe has long been world leading due to a particular focus on crew welfare in Scandinavia, and increasingly in the rest of Europe. Euroconsult expects the number of VSATs in the fishing segment to increase 400% by 2024, while bandwidth consumption per vessel is expected to more than double. Through its resellers, Telenor Satellite provides satellite connectivity to well over a 1,000 maritime terminals across EMEA with fishing attracting the largest growth in the past 12 months with a 115% increase in vessels adopting Ka-band. Driven by our unique northern coverage, larger fishing vessels in the northern-most deep-sea were the first to migrate to Telenor Satellite’s Ka-band service. With high availability, reliable coverage and a small antenna size of just 60cm, Telenor Satellite’s VSAT solution allowed them to retain valuable real-estate on-board their vessels. Like many other maritime sectors, the fishing industry also has growing ambitions when it comes to ‘the online ship’. 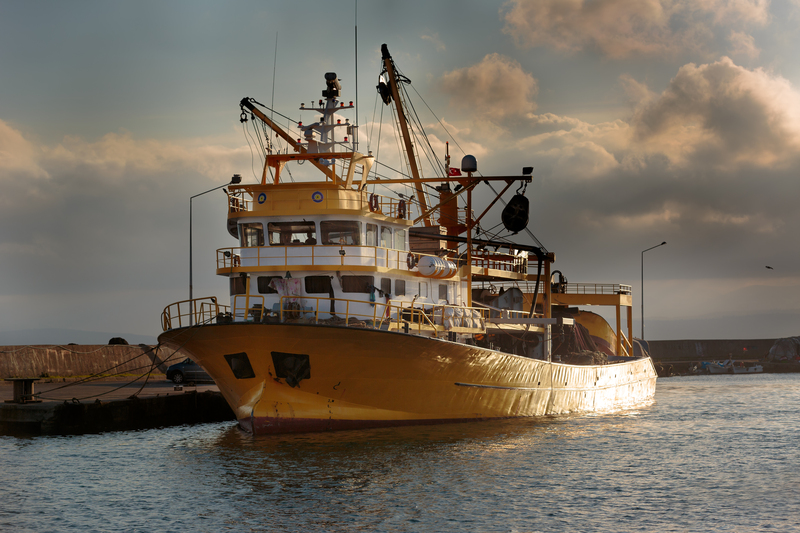 Increased demand from crew, regulatory requirements, and newly developed concepts related to smart shipping are some of the major factors pushing fishing operators to install the latest generation of satellite systems on their vessels. Operationally, safety services, weather mapping, tracking and recording fish prices, as well as business-centric emails are high on the list, whereas from the crew’s perspective, voice, video, WhatsApp, TV and social media are leading applications. Connecting personal devices will likely still remain a ‘nice to have’ for most vessels and with a little thought and appropriate guidelines, the crew and onboard management can ensure that these great invention is made use of for wellbeing and betterment. 12 months ago, we started to see a demand for further coverage in the north and extended our reach to accommodate those fishing fleets who were taking advantage of warmer waters. Our customers were casting a wider net and we had to match that. We monitor the activities of our resellers and their end-users very closely to ensure we are on trend and delivering the right requirements for our customers all year round. This means providing reliable connectivity under some of the harshest conditions a VSAT will ever operate. Historically, fishing has been a tough market to crack as many fishing vessels didn’t have the budget to invest in VSAT technology. However new technologies are shaking up the maritime industry every day. But the biggest changes we are already seeing lie in the face of IT and digitalisation in the industry. Ship owners will already be aware of the changing face of ship emissions and smarter fleet management, but are they aware that developments in robotics and deep learning computers are also set to impact on their operations? It’s safe to say that VSAT is at the helm of new technologies typically facing the fishing markets, but that’s not to say it will stay that way for long. Augmented reality and Virtual Reality is already being developed for maritime applications and has been demonstrated on ship bridges and remote operating centres to deliver different levels of information to end-users. Shipping is becoming autonomous and IT giants, such as Amazon and Google are even sinking their teeth into shipping and looking at ways to transfer their technologies across. Fishing is a segment where we can see the VSAT market is growing steadily. The expectation is that regulatory pressure on fleet, combined with smaller terminals and better pricing, will drive the market. In fact, it is anticipated that the fishing segment will experience the second highest annual growth of VSAT-equipped vessels after commercial shipping by 2026. Despite this fact, the market could grow further based on new applications that bring commerce onboard. For example, VSAT connectivity can drive greater online sales of catches and auctions. Preparing our fishing customers for the future is a priority today. We have seen the growing demand for more capacity as vessels are becoming better equipped to serve cabin and crew; therefore we have developed a new product – Anker Quota – which was designed for sporadic users who want a speed based product with a data cap. We have seen a lot of consolidation over the past few years and seen VSAT taking a larger share of the market supported by improving coverage, capacity supply and decreasing hardware prices. Demand for transferring high amounts of data to and from vessels has increased astronomically over the last two years proving the switch to a broadband terminal to be a viable option and adding pressure on ship operators to provide a better overview about the vessel’s operation and welfare of the crew.